This is the second post in a series looking at legislative and regulatory action addressing Electric Vehicle (EV) greenhouse gas emission (GHGE) reductions. This post focuses on efforts by the California Public Utilities Commission (CPUC). In 2013 Governor Brown, as the head of the executive, took the first step to electrifying California’s transportation market by issuing Executive Order B-16-2012, which set the long term goal of achieving 1.5 million Zero Emission Vehicles (ZEVs) on California Roadways by 2025 and a reduction of transportation-related GHGE by 80 percent below 1990 levels by 2050. The term “ZEV” refers to vehicles that emit zero tailpipe pollutants from the onboard source of power, which includes hydrogen fuel cell electric vehicles (FCEVs) and Plug-in Electric Vehicles (PEVs). The ZEV Action Plan provided the CPUC with deadlines, opportunities for collaboration with other California agencies, and specific tasks necessary to reach the Governor’s target, such as: developing electricity tariffs and pilot programs, reducing the costs of ZEVs by encouraging investor owned utilities (IOUs) to conduct consumer outreach concerning time-of-use (TOU) rates, and promoting consumer awareness by ensuring electric usage of PEVs is presented clearly on consumer’s utility bills and demonstrating savings compared to conventional gasoline and diesel fueling. The CPUC has been delegated broad constitutional and statutory powers to regulate intrastate investor-owned electric, natural gas, telecommunications, and water utilities. The CPUC has full plenary authority over the operations of the IOUs to set and design IOU retail rates, as well as regulate the distribution level grid and IOUs. While the CPUC does not have authority over fossil fuel transportation, it does have authority over the electric sector in terms of distribution level tariffs and infrastructure, including behind the meter tariffs and funding for EV charging stations. In 2009 the legislature passed SB 626, codified at California Public Utilities Code §740.2, which directed the CPUC, in consultation with the California Energy Commission (CEC), the California Air Resources Board (CARB), and the motor vehicle industry, to “evaluate policies to develop infrastructure sufficient to overcome any barriers to the widespread development and use of plug-in hybrid and electric vehicles.” The enactment of §740.2 was the first step in granting the CPUC specific authority to implement rules necessary to facilitate the widespread deployment of EVs in California. Shortly thereafter and pursuant to SB 626, the CPUC began adopting rules to support the deployment of EVs by opening R.09-08-009 , better known as the Alternative-Fueled Vehicles (AFV) Rulemaking in August of 2009, which would later be replaced by R.13-11-007. The AFV Rulemaking was the first to consider the impact EVs would have on the state’s electric infrastructure, AFV tariffs (such as PG&E’s Residential Electric Schedule EV), and policies to support California’s GHGE reductions goals. After the closure of R.09-08-009, the CPUC continued to address issues of AFV development in R.13-11-007 by considering barriers remaining to widespread vehicle electrification, including new tariffs, pilot programs, rates, sub-metering, and financing strategies designed to encourage electric vehicle integration. While the second track of the proceeding focuses on the development of new AFV tariffs of the IOU territories, the first track is dedicated to examining Vehicle-Grid Integration (VGI). Anticipating the widespread adoption of EVs in California, managed charging strategies are necessary to ensure that EV charging does have a substantial impact on peak load. However, EVs should not only be thought of as having negative grid impacts because VGI presents the opportunity for EVs to provide services back onto the grid. Under the VGI Roadmap in collaboration with the California Independent System Operator (CAISO), the CPUC developed distribution level use cases for which CAISO (whose role will be discussed in the subsequent blog post) would build on to determine how to aggregate EV resources that will reach the wholesale system. Readers can link to the CPUC’s Vehicle- Grid Integration document that includes the use cases here. The direction of the power flow at the point of interconnection (unidirectional “V1G” or bidirectional “V2G”). V2G, or bidirectional power flow, when fully implemented would allow EVs to provide power back to the grid by taking power from the battery of the EV when necessary to meet demand. 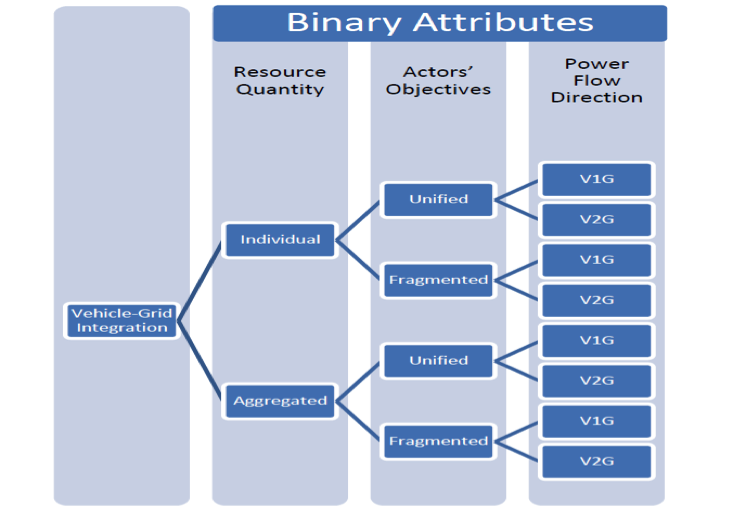 Unidirectional power flow (V1G): One resource and unified actors. V1G with aggregated resources: Many resources and unified actors. V1G with fragmented actor objectives: One or many resources and fragmented actors. Bidirectional power flow (V2G): One or many resources and unified or fragmented actors. The CPUC proposed that the use cases be implemented sequentially beginning with the most simple and increasing in complexity. For example, unidirectional V1G with one resource and unified actors is the most simple use case and should be implemented first, followed by VG1 with aggregated resources, and so on, each building on the regulatory framework of the previous, less complex use case. Determining the primacy among the potential VGI activities. On December 18, 2014 in D.14-12-079, the CPUC greatly expanded the IOU’s role by addressing the aforementioned second regulatory barrier. Previously, IOUs were required to show that a market failure or underserved market would result if it were not for the proposed utility program. However, under D.14-12-079, the IOU’s role as aggregator will now be determined on a case-by-case examination of a proposed program. In this decision the CPUC declined to prospectively determine the appropriate level of IOU activity in aggregation and interaction with the wholesale market and will instead address each program on an individual basis. If the potential for the utility to unfairly compete is identified, the commission will determine if rules, conditions or regulatory protections are necessary to effectively mitigate the anticompetitive impacts or unfair advantages held by the utility. The CPUC recently applied the benefits analysis to a proposal filed by PG&E on February 9, 2015, in which PG&E asked to build 25,000 EV charging stations across its service area. Under the proposal, PG&E would own all of the infrastructure and contract with third parties to build, install, and maintain the chargers. This “make-ready” approach, which was also proposed by both SDG&E and SCE, provides for the utility to own everything up to the charging station and third parties to own the charging units. However, many criticize the make-ready approach because if approved, utility ownership could stifle healthy competition and the cost of the program would be borne by ratepayers because the project contributes to the state meeting its clean energy mandates. 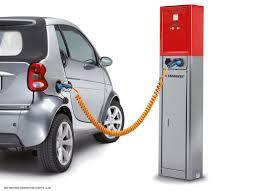 On September 9, 2015 the CPUC proposed that PG&E instead build 2,510 of the 25,000 EV Chargers requested for the first two years of the program. The scoping memo and ruling asked PG&E to submit a supplement to its application finding that the original proposal “does not allow for adequate review and evaluation to determine whether its costs are just and reasonable, whether it results in ratepayer benefits, and whether potential anticompetitive impacts are adequately prevented and/or mitigated.” Once this information is submitted, the CPUC will evaluate PG&E’s proposal to examine impacts on ratepayers and competition through its evidentiary hearing process that examines filed testimony, briefings, comments, and replies. This process will most likely lead to a proposed decision being submitted to the Commission for a full vote. CAISO, which will be discussed in the subsequent EV blog post, is still working to ensure that potential receipt of these newly aggregated distributed resources will not negatively affect the management and reliability of the wholesale grid. This entry was posted in Energy, Transportation and tagged California, California Public Utilities Commission, Electric Vehicles. Bookmark the permalink.